Sister Winifred Morgan, O.P. (Mary Arnoul) grew up in the west side of Chicago, in Austin, near Oak Park. At that time, her neighborhood was mostly Irish and a mix of working and middle class. Her father was a pipefitter. Her mother taught elementary school until Sister Winifred was six years old, when she chose to become a homemaker. Sister Winifred attended public school for kindergarten, then went to the parish school, Our Lady Help of Christians, and graduated from Trinity High School in River Forest, Illinois. She got her B.A. in English at Rosary College (Now Dominican University) in 1961, her M.A. in English at the University of Texas in 1971, and her Ph.D. in American Studies at the University of Iowa in 1982. The title of her dissertation is: An American Icon: Brother Jonathan in the Popular Media Between the Revolutionary and Civil Wars. She entered the Dominican Order in her early twenties, her profession date being August 5, 1960. 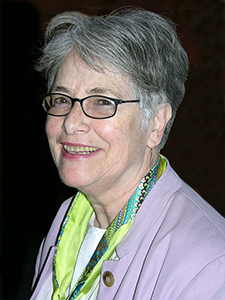 Her teaching experience includes teaching in secondary schools in Wisconsin, South Dakota, Texas, and Illinois; teaching as Teaching Assistant at the University of Iowa in Rhetoric and American Studies; visiting professor at Universities of Valladolid and Salamanca, Spain; Professor of English at Edgewood College.